Martin Griffith, Special Envoy of the Secretary-General for Yemen, briefs the Security Council meeting on the situation in that country. 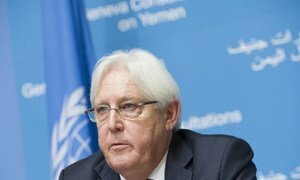 A positive environment exists for building trust between the opposing parties involved in discussions for a political solution to the Yemen conflict, despite the absence of one of the delegations in Geneva and insecurity on the ground, UN Special Envoy Martin Griffiths said on Saturday. Acknowledging the “elephant in the room” - the fact that the Ansarullah-Houthi delegation was not present in the Swiss city for the consultations - the UN negotiator insisted it was not a “fundamental blockage” to his work. Both the people of Yemen and the “remarkably united” international community wanted him to succeed, Mr Griffiths insisted, adding that he intended to meet Houthi representatives in Muscat, Oman, and in Sana’a, the capital of Yemen, which they control. He insisted on the Houthi delegation’s willingness to engage in the UN-organized political process. During three days of “very fruitful” discussions with the Government of Yemen Mr Griffiths underscored the progress made on so-called confidence-building measures: the release of prisoners, the reopening of Sana’a airport, economic issues “of extreme importance” and a humanitarian access in areas “where it is possible” and pauses in clashes to allow the vaccination of children to proceed. Noting the importance of his parallel discussions with women’s representatives in Yemen as well as those participating in the Geneva consultations, the Special Envoy insisted on the importance of remembering the grave humanitarian situation in the war-torn country. Speaking to journalists, the UN negotiator added that he was also keen not to let “too many days and weeks” before fresh meetings resumed. “If I didn’t think, if the Secretary-General didn’t think that there was a real desire for peace, firstly, and secondly that there is a real solution - a political solution to this war - then we wouldn’t be wasting your time,” he said. 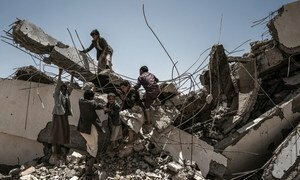 The United Nations Special Envoy for Yemen met Government representatives on Thursday at the start of what were due to be the first peace talks involving both warring parties to be held in two years, vowing to “overcome obstacles” which have so far prevented the Houthi rebel delegation from showing up. Efforts are under way to bring a “flickering signal of hope” to war-weary civilians in Yemen with UN-organised consultations between the Government and the Houthi opposition in Geneva set to begin, the UN’s Special Envoy Martin Griffiths, said on Wednesday.